You do not need refined sugars to make jam. 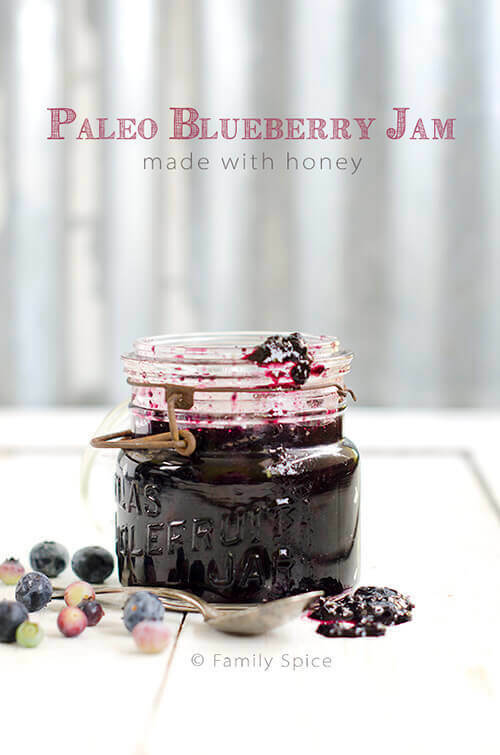 This Paleo Blueberry Jam is thick without additional pectin, and is simply sweetened with honey. I have seen how potatoes are grown and harvested. I have walked through avocado groves. I loved strolling through olive groves. And I loved visiting all types of farms when I visited California’s central valley with the Farm Water Bureau. 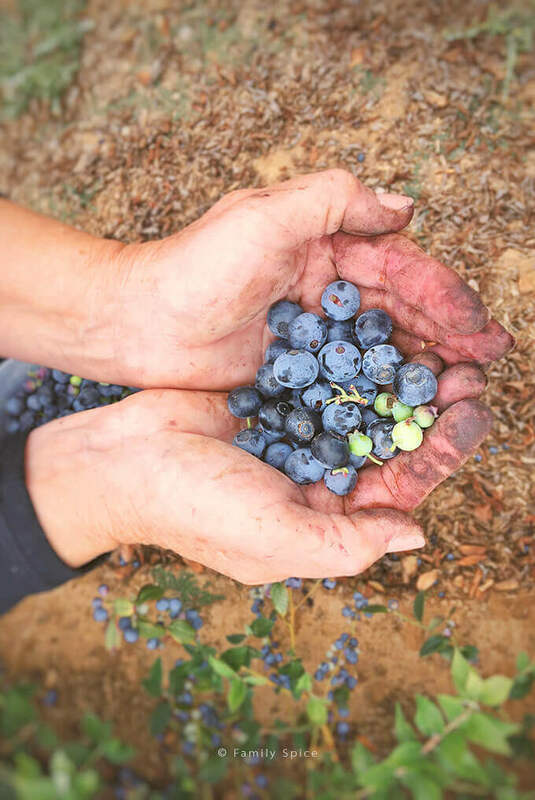 So when Mary invited me to go blueberry picking on a local farm, well, she didn’t have to ask me twice! We have small blueberry bush in our yard. It’s sad and neglected and the kids pluck any ripe blueberries the minute they ripen. I have never seen rows and rows of massive blueberry bushes so beautifully studded with ginormous blueberries. Mary and I were the only ones lucky enough to be there and we were baffled on where to start. Eventually, after giggling our hearts out, we began plucking the fat blueberries off one by one. We realized that we were not working efficiently, and our giddy excitement was replaced with a little competitive fun. The blueberries were sweet and juicy right off the bush. I had never seen such big blueberries. You certainly don’t see them at the grocery store. Big ones. Fat ones. Small ones. Sour ones. Our hands quickly stripped the bushes. Yet, as we looked back, it looked as if the bushes were untouched. There was no way we could pick them all. And quite honestly, we didn’t need to. I came home with more blueberries than my family could eat. And well, they certainly attempted to eat as many as their tiny stomachs could – including the sour ones. After sharing blueberries with family friends and swapping berries for loquats and avocados, I began cooking. 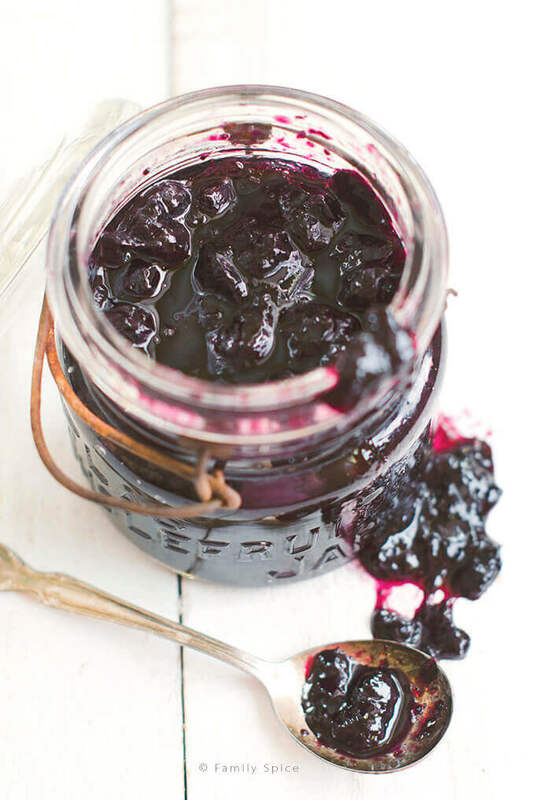 I knew exactly what to make first: Paleo Blueberry Jam. Making jam is family tradition. My mother, grandmother and aunts and I love making jam. All kinds of jams, too. I have made blueberry jam before (with brown sugar) so I knew I wanted to try something different. This time, I made blueberry jam with honey. This is a paleo-friendly recipe. It is thick and dreamy and only as good as the blueberries you use. My glorious blueberries made an equally glorious Paleo Blueberry Jam. I will be enjoying spoonfuls of this jam for the next month or two. In a large non-reactive pot over medium heat add blueberries. Using a potato masher, press down on blueberries to burst and release juices. Bring jam to boil, and remove the foam that forms. Reduce heat to medium and continue cooking until jam thickens, approximately 20 minutes. If you prefer a chunkier jam, leave as is. For a smoother jam, continue mashing or use an immersion blender. If you are going to store in the refrigerator, cool until room temperature first then transfer to an airtight container. Or, if you are canning your jam, click here for canning instructions. 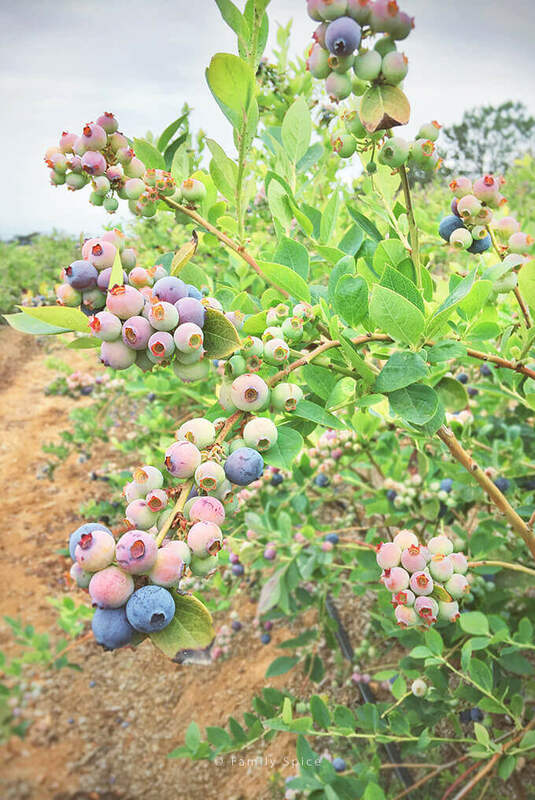 Love the story…Love blueberries. And am grateful for your yummy pectin-free jam recipe which looks and sounds delicious! P.s. 1 Bet you won the most blueberry picker prize. Ps 2 Did you ever read Blueberries for Saul as a kid? So what do you use it on from a Paleo standpoint? I love jam and have some great ones (Huckleberry, Cantaloupe, etc.) but I’m used to eating on bread or crackers so since going Paleo our jam consumption has definitely dropped. There are lots of recipes out there for paleo crackers and bread. You can also use the jam for paleo dessert, like thumbprint cookies. Instead of traditional flour, paleo baked goods usually use alternate flours like coconut flour and almond meal. One of my favorite sites are https://elanaspantry.com and Carolyn of http://alldayidreamaboutfood.com/ makes low carb foods that are friendly for diabetics. 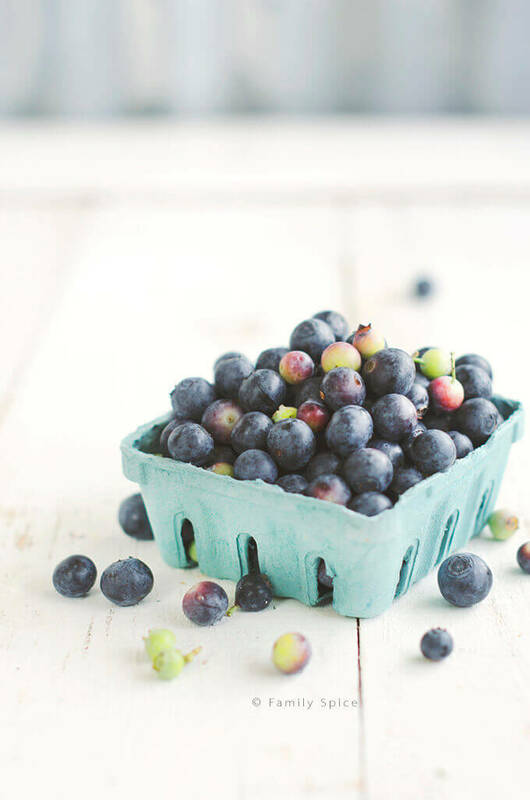 This recipe sounds delicious, but in Washington state we’re a long way off from fresh blueberries…but I still have frozen berries! Will they work in this recipe?? Absolutely! 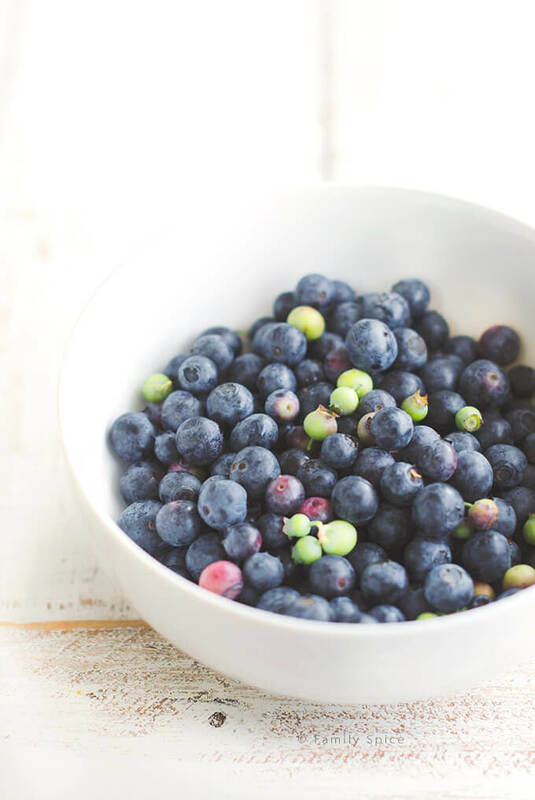 You may not need as much water with frozen berries as you would with fresh, but the basic recipe works the same.